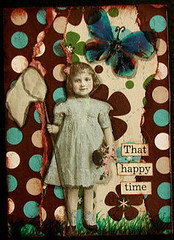 Collage Tip, Newest Giveaway – Hectic Lives! 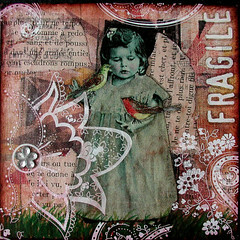 Fragile – For Sale Here! What a perfect piece to kick this off. Fragile. Much like I have been these past 6 months. Mentally, physically, and everything in between (if that’s at all possible). I can’t begin to tell you what an amazing feeling it has been this week, slowly working towards my goal of regaining control over my lil life. I have found freedom within my art and a hope I forgot existed within my surroundings … a tediously slow process, but one well worth taking. After all, It is the difficult journeys, that are the most worthwhile. Initially, I intended to write a full entry here, but as I began to – that dreaded ‘I’m so behind, I’m so utterly overwhelmed feeling‘ started to take me over once again. I will show you some photos of my studio this week.. and you’ll begin to understand why! I’m going to use the time I set aside for writing here, to continue cleaning, and creating in there today. Hopefully – I’ll get one step closer towards not having that one small thing hang over my head. Besides, art time always does me good! 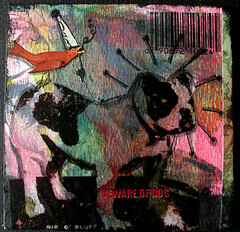 Beware of Dog – For Sale Here! Ha! I felt like that proverbial dog.. just ready to snap, at any given moment, for any given reason. Some days, I still do, but I feel myself rising out that with every small step I take. So very empowering! 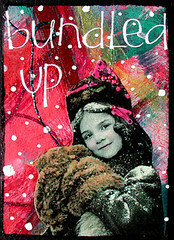 Bundled Up – For Sale Here! 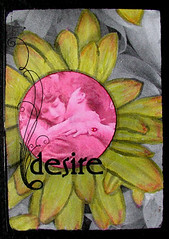 Desire – For Sale Here! And that, IS my deepest desire right now. It’s why you haven’t seen me ‘around’ as much recently. In order to get everything in order, I have to step back from some things and take that time and use it a bit more wisely. Getting organized once again, is quite possibly the best thing I have done for myself in a very long time. My health, really set me back in that department.. and it’s time, long overdue – to put a full force effort into doing what needs done to thoroughly enjoy living again. Quite often, like most of us – I focus on what everyone else needs, it’s ‘me’ time now. A Huge undertaking, but as I mentioned earlier.. one that’s worth it. I feel like a broken record some days.. but bear with me while I get everything in order, I promise – it’ll be well worth the wait! I have some fabulous ideas I can’t wait to take action on… but not until this is all done! So emails, etc will continue to take a backseat as I continue this Mission: Life Organization quest. Treasure – For Sale Here! Today’s Contest: The first 5 people to comment with their best organization/time management tip, will receive one of these brand new, fun David & Goliath Disco Queen Briefcase Purses! I’ll contact you using the email address you provide in the comments section for your address. 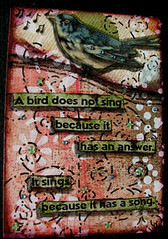 Why Birds Sing – For Sale Here! 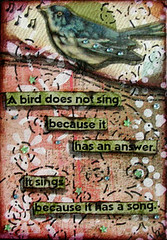 Today’s Creating Art Cards (Artist Trading Cards, ATC’s, ACEO’s) Tip! Ever have a collage, that just doesn’t seem to seamlessly blend, when all elements don’t’ quite work together? Try unifying your collages with a wash of watered down gesso, tinted glaze, watercolor or even watered down paint.. apply a thin layer across your entire piece, or rub the glaze into the crevices. Spatter paint with a toothbrush across it all, spray walnut ink .. the possibilities are endless. Fear is what usually stops us from trying that one extra step – don’t let it get the best of you! What have you got to lose? Come back tomorrow for another give-a-way and a new tip! Click the button below, to be notified via email when I update! Strong Love – For Sale Here! That Happy Time – For Sale Here! 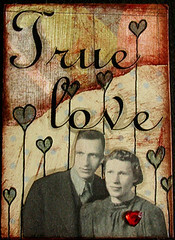 True Love – For Sale Here! Well now, I ended up writing anyway didn’t I? Still, not as much as I intended, so that’s progress! Well, my hands & wrist are sore from all this computer time… time for me to scoot off here, and go make some more sense of my studio! Hello best time and organization tip is….data base and spread sheets! As soon as you have a project come in, go out, or sign ups and due dates for swaps..the best. Another great tip always have a small not pad to jot down ideas or things you dont want to forget. LOOK at it every day!! Love the atc’s you’ve posted! My best organization tip – especially when working on multiple projects at once – keep as much of each project as possible in a large ziploc baggie or plastic envelope when you aren’t actively working on that project. I do this with ATCs and fatbook pages. Since I do them in stages, this ensures that I keep all the relavant pieces together. Then, when final assembly time comes around, I just pull out the bag or ennvelope, along with whatever tools I need, and I don’t waste time with things like “now where did I put those stupid flowers” or “what happened to my ribbon”? Well Chrysti I have to 1st say I am glad that you are back and your art work is absolutely beautiful!!! LOVE everything and hope that you are getting well and taking care of yourself!!! and may your art bring you peace as well as joy!! and now I find that my way to organize myself is when I am working on several things I try to keep the same items I use for each one at hand create the 2 or 3 pieces I want with those items (inks, paper, paint etc) on my table close at hand and also all my collage items are in separate envies and I keep them all in a box upright near my table and that way i can complete more than one project and use just what I have on my table and then when done I clean it all up and then start on a new one with differnt things but gather 1st and use just what you have gathered to start with and it makes less mess and also makes you use exactly only what is there!!?? hope that makes some sort of sense it works well for me!! and my table only has a small space to work because I keep all my treasured art objects on the table too!! kind of scary at times!!! hehehe! well have fun arting dear and glad to see all the fun new work!! amazing!!! Wow!! Chrysti….Your art just gets more amazing!!! I can’t decide which one is a fav here lol…Beautiful work!! My only organization tip which would be for my studio…since my desk is always a disaster…paper tends to get misplaced often….I use alot of post it notes and to keep from hunting down a notebook….I have a big dry erase board next to my desk….for a quick jot of things to get done…and personal reminders and time to time a quick sketch or idea….Keep up the great work!! Hugs to ya!!! Your collages are fantastic. I have never gotten the hang of doing them myself and admire those who can put something together such as you do. They are wonderful. I’m a bit late in the ideas for organization but mine is as old as the hills…a place for everything and everything in its place. Now if only I could be so diligent myself. I love Gypsy’s comment. That is where I am at right now! Hi Chrysti–I have a few organization tips I wanted to mention as I’ve spent years trying everything! I’ve had to teach myself how to be as it doesn’t come naturally! First I want to say that I love the above tip on unifying the collage. 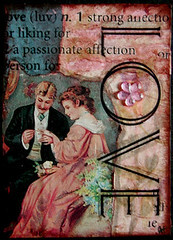 I certainly will try that as I adore the ATC I bought from you and it’s in my studio to inspire me. 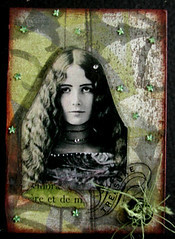 I also love the way you matted the atc, can you let me know what you used to adhere it? it looks like the art was done directly on it, it’s so well done. Hopefully this will be your next tip–keep them coming, I love to learn. I have never had the privilege of seeing these things done “in person.” and I’m a visual learner, but throught alot of trial and error, I’m slowing figuring it out. Anyway, here are 4 organization tips I hope will help others. 1. First and foremost, organize the way you think and the way that works for YOU. Don’t try to fit a mold. Look at things you’ve organized successfully and try to duplicate that in your studio space. Discipline yourself to put things away. This takes alot of practice, but it really helps! 2. I do some legwork ahead of time so I have collage pieces “waiting” for me to put together when I have the time and am inspired to do so. While clearing office space and when I see images I like, I plop them in a metal basket and have them waiting for me later. Half of getting started is having stuff ready to go. 3. Baskets and jars for quick corralling of “junk” comes in handy for me. 4. Do stuff you don’t like when you are high energy. Some organizing isn’t always pleasant, but necessary to find things you need. Chrysti, every time I look at your art I am overwhelmed by the richness and beauty of it; it just continues to increase in depth and texture. I just had to pause here and applaud you! !